ALL-TAG, a leading manufacturer of anti-theft Security Tags, Security Labels, and People Counting Systems, announces a new custom printing service that allows their 8.2 MHz Radio-Frequency (RF) Adhesive Security Labels to offer retailers more than just an anti-theft measure. ALL-TAG has been manufacturing and selling their RF Labels to retailers, distributors, and retail product manufacturers all over the world since 1992. 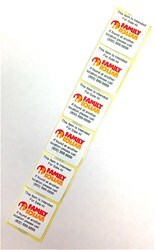 The primary function of the ALL-TAG Security Labels is to help retailers reduce shoplifting and improve their bottom line. ALL-TAG now offers retailers the option to have their logos, addresses, special warnings, or anything else they might want printed on the labels. This allows retailers to promote a particular product or brand, create a more effective shoplifting deterrent, or control Organized Retail Crime (ORC). "We opened our U.S. manufacturing plant not only to ensure immediate order deliveries to our customers, but also to provide them with custom on-demand ordering options," explained Sales and Marketing Director Andy Gilbert. "Investing in the equipment necessary to print high quality multi-color images and text on our RF Labels is another example of our commitment to providing our customers with value added products in a timely fashion." ALL-TAG is the second largest global manufacturer of 8.2 MHz Radio-Frequency (RF) Labels that are compatible with all Checkpoint Electronic Article Surveillance (EAS) Systems and Label Deactivators. "ALL-TAG is the only U.S. manufacturer of RF Labels, and we are certainly the only one offering custom printing options that can be done quickly and accurately," Gilbert confirmed. "We are happy to see retailers getting excited about using our RF Labels Hello their business is ways other than just reducing shrink." ALL-TAG also designs and produces a wide variety of sensor tags for apparel and other soft goods that are compatible with both Sensormatic and Checkpoint EAS Detection Systems and Security Tag Detachers. For more information about products mentioned in this release, please visit http://www.ALL-TAG.com. Electronic Article Surveillance (EAS) Tags and Labels are commonly known as Sensor Tags and Labels or Security Tags and Labels. EAS is a technological method for preventing shoplifting in retail stores, libraries, and other businesses where merchandise is on display. Sensor Tags are fixed to merchandise and are removed or deactivated by personnel when the merchandise is properly bought or checked out. At building exits, detection systems are installed that will sound an alarm or alert the staff when an active tag or label that has not been removed or deactivated passes through the exit. ALL-TAG manufacturers Electronic Article Surveillance (EAS) products and services designed to help retailers protect their merchandise from shoplifting. For many years, the company has supplied affordable, reliable, and user-friendly People Counting Systems to retailers, libraries, museums, and many other businesses. The original ALL-TAG RF Label factory, located in Manage, Belgium, has been producing RF Labels for retailers throughout the world since 1992. ALL-TAG Security Americas Inc., located in Boca Raton, Florida USA, opened in 2000 as a global sales and marketing office. In July of 2011, ALL-TAG Security Americas Inc. launched a new production facility to manufacture labels in the United States. The new factory supplies RF Labels to our US customers, as well as many other customers around the world. The company also has an inventory warehouse in Hong Kong to ensure timely deliveries to our many customers in Asia and the Pacific Rim.